A register of Pioneer Families of Bathurst NSW and District before 1900. 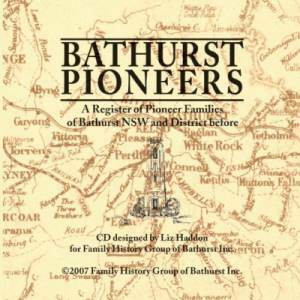 The Bathurst Family History Group Inc. published a comprehensive Pioneer Register in 2007. The publication includes entries for 5,239 pioneers. Some of these (about 200) are alternate spellings which point to another entry. Overall, there are more than 31,750 named people in the Pioneer Register. There were more than 750 contributors for this Pioneer Register. Both the CD and the book include specially prepared maps which include some place names that are no longer used and an index of place names to help you find them. The CD may be used on one computer only and will run once only before it must be activated over the internet, by phone or by mail. It will run on a PC with Windows. The book version sold out very quickly and was expensive to publish. We are now selling the Bathurst Pioneers book version in pdf format for $35.00. It should run on all computers and tablets.